For the second time in three months the government has found itself in open confrontation with the Catholic Church. At the end of last year, powerful protests from the Church forced Tony Blair into what was branded "the fastest U-turn in British political history". Originally, he had insisted that new faith schools should be forced to accept 25% of their pupils from other or non-faith backgrounds. It was abandoned within days in face of the protests. 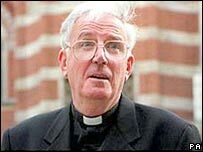 Now he is facing a similarly robust campaign, led by the Archbishop of Westminster Cardinal Cormac Murphy-O'Connor, demanding an opt out for Catholic adoption agencies under the new gay rights laws. If they fail to get the exemption, the agencies may be forced to close, he has warned. And many in Westminster fear that, after the last about-face, it is only a matter of time before the government again gives way. Since when have the laws of England not applied to the church? It is an issue that has provoked powerful reactions from all sides and which has seen the prime minister and his Communities Secretary Ruth Kelly under fire from those demanding they stand firm in the face of "blackmail". Cherie Blair is a Catholic and there has long been speculation that the deeply-religious prime minister may himself convert - perhaps when he leaves office. 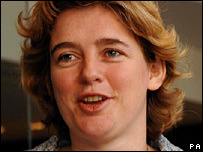 Ms Kelly is not only Catholic, but a member of the controversial Opus Dei group and has previously been under attack for that group's attitude towards homosexuals. It is now being claimed that she is seeking some sort of opt out from the equality laws to allow Catholic adoption agencies to continue refusing to accept gay couples as adoptive parents. It is being said the prime minister is of the same mind although spokesmen for both individuals insist they have made no decisions on the "sensitive" issue. And supporters of the archbishop's call claim it would be wrong to force members of any religion to act in contravention of their faith. What seems certain is that a Cabinet battle is now looming over this issue which threatens to whip up a full-blown Commons row, with many on the Labour benches angry at the archbishop's move. 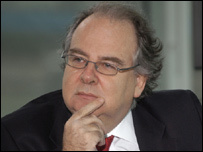 The Lord Chancellor, Lord Falconer, insisted it was "difficult to see" how an exemption could be justified. "We have committed ourselves to anti-discrimination law, on the grounds of sexual orientation, and it is extremely difficult to see how you can be excused from anti-discrimination law on the grounds of religion". Meanwhile, Terry Sanderson, president of the National Secular Society, echoed the views of many in Westminster when he declared: "The Catholic Church must not be permitted to control our legislature through this kind of blackmail. "It did the same thing over the faith school quotas proposed last month and successfully blew the government off course. "If it manages to achieve the same result with these regulations, we need to ask who is running this country - the government or the Vatican?" It is thought the prime minister may be seeking some sort of "third way" on the issue that would allow Catholic agencies to continue to pass gay couples on to other agencies, for example. But this is another row the prime minister could well live without as he attempts to plot a storm-free course to his retirement. Should church be able to opt out of gay rights laws?